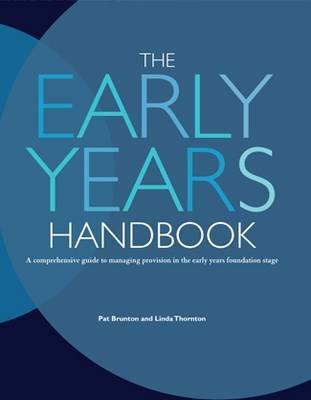 Early Years Handbook provides a complete guide to establishing and running high quality, sustainable early years provision which provides good outcomes for children and meets the needs of parents and carers The Early Years Handbook is designed to help you to carry out the duties and responsibilities involved in running early years provision for children under the age of five, whether you are working as part of a school, children's centre or an independent nursery. It combines information on legal responsibilities with advice and guidance on how to plan and manage the wider aspects of running an early years setting. It includes a range of sample templates and proformas which can be used as starting points for developing the paperwork, policies and procedures which underpin good quality early years practice. This comprehensive guide will enable you to: *Understand the impact of recent provision developments on young children and families *Support you to make an application for funding and write a business plan *Understand the values that underpin quality provision and learn how to project your vision to those who are going to use it *Be aware of legal arrangements to avoid problems and pitfalls and learn how to manage and monitor budgets efficiently *Provide appropriate and successful learning opportunities for young children and the right setting for them to thrive in *Successfully lead and manage a team to provide high quality care *Grow and develop your business for continuous improvement in the quality of services provided. There are many challenges involved in establishing and running successful high quality, sustainable early years provision which provides good outcomes for children and meets the needs of parents and carers. The management of an early years setting, in the maintained, private, voluntary or independent sectors requires a wide range of skills and experience. Expertise is needed in childcare and child development, learning and teaching, managing premises and personnel, business planning and budgeting and in marketing and promotion.